JERUSALEM, Ohio — Rabbits may not be what you think of when you hear the word livestock, but for a Monroe County family, they are the perfect animal for their operation. Aaron and Betty Rousenberg were not new to the idea of raising rabbits, but they were new to the business. Aaron had shown rabbits when he was in 4-H and even brought home the grand champion ribbon from the Monroe County Fair in 1979. However, life had taken a different path until his daughter, Brittany, 15, decided she wanted to show them about seven years ago. The Rousenberg family started with six cages. Today, they have 100 cages, however, only 50 of the cages are full. He said check back in January and that will have changed. Now, the entire family is part of the rabbit operation, including the youngest, Gauge, 11. The Rousenberg family raises New Zealand white rabbits, which are a meat breed. They breed primarily for the showing season, which means the rabbits are bred about four times a year. They raise club rabbits and others for the meat market. The Rousenbergs said they like working with rabbits because they have limited acreage, and the animals work well for their family. 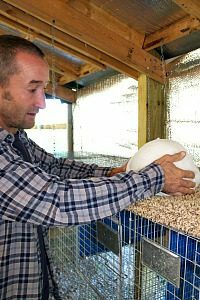 Although Aaron said they have experienced some downfalls, they have developed a lot as a breeder and caretaker for the rabbits. He said that each one in the family has his own skills and chores. When asked why rabbits instead of cows, the family has an easy answer. “Ninety-nine percent of the time we know where our animals are. We aren’t trudging around a pasture looking for them,” said Betty. Aaron said they don’t process rabbits on site, however, there is a standing list for consumers wanting to purchase rabbits for their meat. They also sell to two or three processing plants including one near Parkersburg, W.Va. He said there is a strong demand on the East Coast, and it is growing because consumers are finding out about the benefits that rabbit meat has compared to other types, in terms of cholesterol. Both Betty and Aaron said they have learned that more meat can be produced from a pair of rabbits than from a cow, proportionally, because of the reduced amount of time it takes for the rabbits to develop to their full size and how many times they can breed a year, as well as how many kits can be born from one pair of rabbits. “We have experimented with different breeds. The New Zealand white rabbits are the best meat rabbit, hands down,” said Aaron. The rabbits are between 65-70 days old then they show them, according to the Ohio Market Rabbit Producers Association rules. He said the family has experimented with different breeds including the New Zealand red type, but the white type works for their family. He said other breeds can take longer for the meat to develop, which puts them at a disadvantage when showing them. The judges are looking for a rabbit between three and five pounds and one that has an adequate amount of meat on the body. They are also looking for a tight hide on the animal. The judge does not want an animal that is going to leave the consumer with a lot of waste. Aaron said the animals work well with their family because of their adaptability. “It’s more than throwing a doe in with a buck, it’s 365 days a year of work,” said Aaron. The average rabbit has a litter size of six kits and the gestation period is between 28-35 days. When the rabbits are due with their kits, pine shavings are placed inside the cages in addition to a birthing box where the rabbits can deliver. The female rabbits start pulling their chest hair out prior to birth, which signals to the family to keep an eye out for the impending birth. He said that if for some reason, one of the mothers does not care for her kits, another mother will foster them. The Rousenbergs simply remove them from the birthing crate and put them in with another mother who is nursing her own. Betty said there is never enough rabbits available for sale when it comes the 4-H season. She said the family is solid booked for the 2014 fair season. Rabbits are tattooed in the left ear for easy identification; it ensures the correct records are kept for each animal. The family uses the computer system, EVANS, to track the rabbits. It is genetic software that keeps records of who was bred to whom, when they were bred, as well as statistics including how long it takes for the rabbits to reach maturity and their meat measurements. The computer software allows the breeders to print out their pedigrees. The system allows producers to keep good records including individual rabbit tattoos and cage tags as needed. 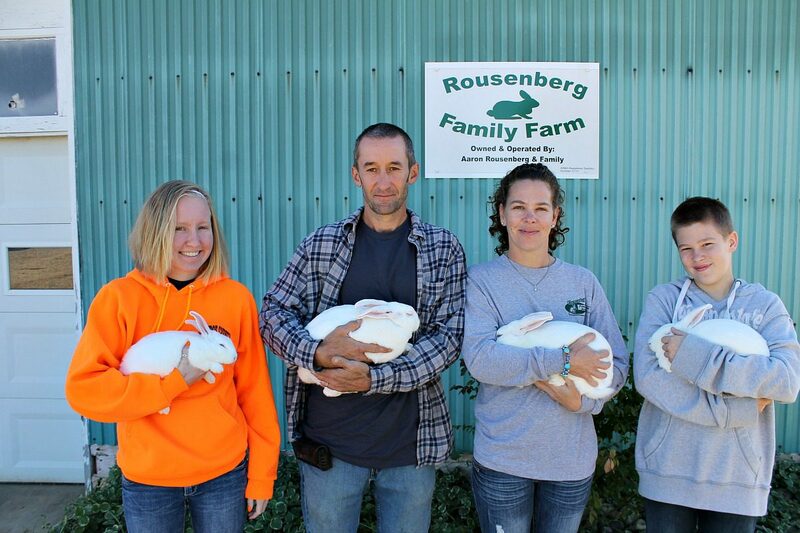 Rabbits from the Rousenbergs’ operation took grand champion honors at Muskingum, Noble and Monroe counties in 2013. For most fairs and shows, the youth raise four of them and pick out the best three to show. Due to their showing schedule, the family practices strict hygiene control in their barn to ensure disease does not spread. The family begins showing in March and it wraps up in December. 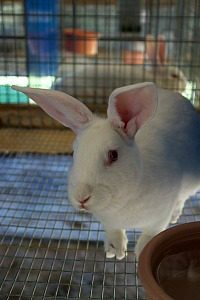 When rabbits are brought back from a show, they are kept in a quarantine area on the other side of the property so that if they did pick up a disease, it does not spread to the other stock in the barn. In addition, the barn is power washed at least twice a year and water bowls are cleaned daily so that a clean environment is kept for the rabbits. Aaron said the care and feeding of the animals is just as important as any animal. The rabbits must have access to clean water. He said at times it is more important than feed. Both Betty and Aaron said they used to worry about keeping the water from freezing overnight but they have learned something about rabbits. They will chisel through the ice to get to their water. “We used to go overboard worrying about them, and we have learned they do better without us hovering over them,” said Betty. Aaron said the one mistake they have seen too many people do is overfeeding the animals. He said it takes restraint but it’s important that rabbits stay in good shape in order for them to breed again. A growing rabbit gets approximately four ounces and a mature adult rabbit requires six ounces. Another thing the family is trying to do is to put the rabbit manure to good use. They have found a market for the compost and are able to increase cash flow with it. They are hoping that they can build the side business into a larger revenue stream in the future. They are also beginning to develop a goat herd in an effort to hit the growing ethnic market for goat meat. Although the breeding and showing season is beginning to wind down for 2013 with only one show left, the Rousenberg family is already gearing up for what 2014 has in store for them. Would like to get a message to Arron Rousenberg regarding additional income opportunity in conjunction with the rabbits. Please feel free to give them my Email , and phone is 315 – 963 – 7870. This is an important opportunity with no additional outllay of capitol. Thank you. J.R.